NWX (Natural Wood X) keyboards are created using Yamaha's unrivaled expertise acquired through more than a century of crafting fine acoustic pianos. The material used for NWX keyboards is cut from wood that has been carefully dried specifically for use in making musical instruments. Only the best wood from the finest part of the tree is selected, resulting in a keyboard that is more resistant to buckling and warping than common laminated wood keyboards. Strike with the perfect balance. Counterweights are embedded in the keys to balance the weight of the hammers and offer more precise control when playing delicately at low volumes. 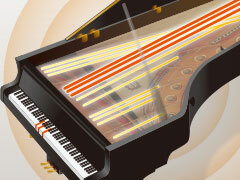 The Clavinova features a carefully-adjusted set of these individual counterweights for improved playability when playing pianissimo and quicker key return in rapid passages. No two keys are alike. 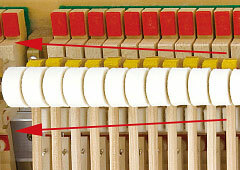 On an acoustic grand piano, each and every key is weighted differently. This is because the strings for each note are slightly thinner and shorter in the treble register, becoming gradually thicker and longer towards the bass register. 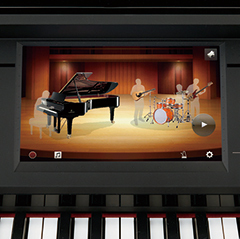 The Clavinova action faithfully reproduces the subtle differences that this graded touch offers with differing weights and key returns for each one of its 88 keys. 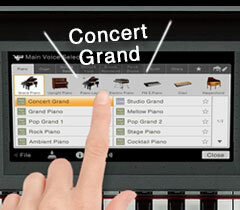 When it comes time to take your playing to an acoustic grand piano, the transition will be seemless to the performer. 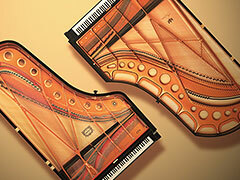 An unrivaled grand piano pedal feel. The CVP-709 features a damper pedal that continually detects depression depth and allows half-pedaling. The GP Response Damper Pedal offers variable resistance, starting out light to the touch and growing heavier as the pedal is depressed further. 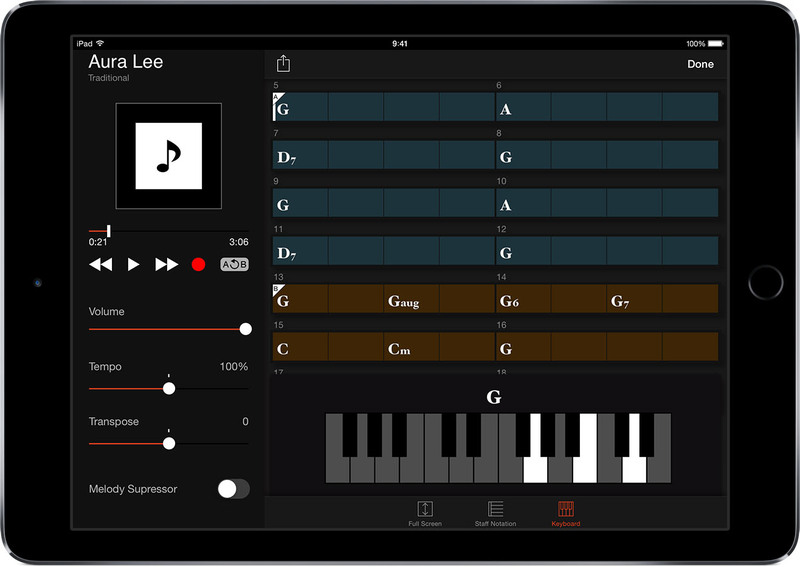 This allows players to become accustomed to the nuances of delicate pedaling on an acoustic grand piano. 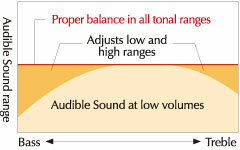 Yamaha's Super Articulation Voices (SA) and Super Articulation 2 Voices (SA2 on CVP-709/709GP) add genuine performance attributes of the real musical instruments as though they were being naturally performed by a virtuoso of that instrument instead of from the keys of a piano keyboard. Examples include "fret noise" or "body knocks" from a guitar or the "inhales", "exhales" and glissandos from wind instruments. By simply varying your touch and playing techniques or using the pedals, SA and SA2 Voices will add significant authenticity to your sound. The CVP-709/709GP offers 30 Audio Styles and have been specially produced by adding audio recordings of studio musicians playing in various recording studios worldwide. This adds all the natural feel, ambience and warmth to the drums and percussion of a Style, giving your performance greater expressive potential. 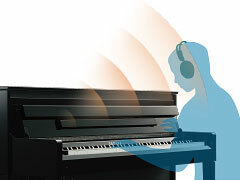 Audio Styles utilize Yamaha's Time Stretch Technology, which allows the audio to follow your tempo changes without changing pitch. Everything stays in perfect sync. 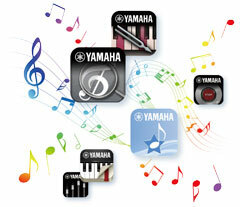 You can enjoy karaoke backing with songs stored in your Clavinova or downloaded from YamahaMusicsoft.com. The lyrics are shown on the display* and the words change color as the song advances, so you know exactly when to come in. You can even display the lyrics on a big TV screen so everyone can join in! The Vocal Harmony 2 (VH2) engine creates advanced sounding harmonies, enriching your voice and is even capable of correcting your pitch! Get in touch with the features you use most. This easy-to-understand touch screen makes the CVP simple to operate: you can touch, slide, swipe or rotate contents in the screen to access different functions and make adjustments. Adjustable brightness ensures an easy-to-read screen in all situations. Other buttons on the panel are laid out in easy-to-see and reach locations. Customize the control panel as you like. You decide what functions appear on the touch screen and which are assigned to special panel buttons. 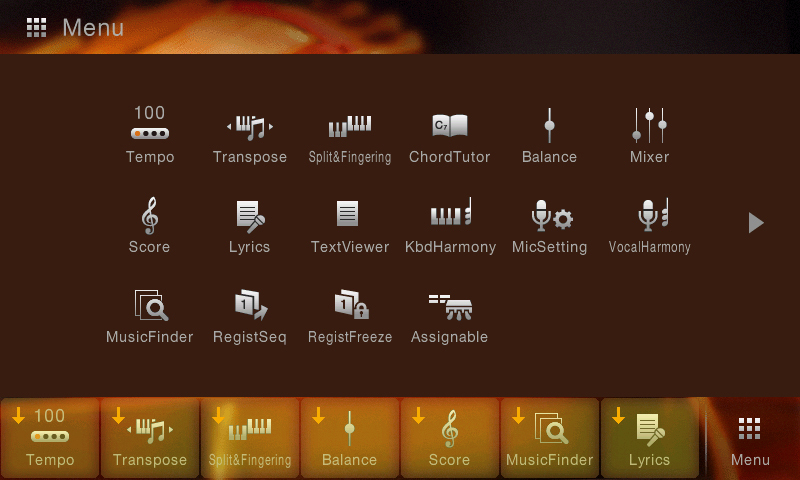 - Assign your most used functions to the ASSIGNABLE buttons on the panel. 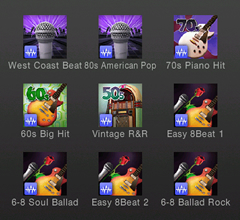 *Stored as WAV or 5 different popular MP3 formats. New Speaker innovations by Yamaha include Spruce Cones and Twisted Flare Ports. Drawing from its experience in building both acoustic pianos and high-end speakers, Yamaha CVP-709 speaker cones use pulp from the same spruce wood used to make acoustic piano sound boards.The result is a more natural, piano-like attack to the sound that is more piano-like when you play the keys.